Wally, short for Waltraud - a nice German name that no one can pronounce, started this business out of her home in Hazel Park in 1993, primarily with weddings. We will be celebrating 20 years in business in 2013 and are so proud of how Wally Spice Photography has grown over the years. We will be this section to showcase the history and great photography of the main photographers at Wally Spice Photography. We each have a rich history of accomplishments and honors over the years and strengths that contribute to the success of our company on the whole. THIS SECTION IS STILL BEING DEVELOPED - Please stay tuned!!! THERE WILL BE PAGES for JULIE and ED and STEVEN to come - plus sections on our activity with the many photography & educational l organizations we belong to! Julie Proudfoot started working for the company 15 years ago - first in editing, then assisting, then working with me as a full 2nd photographer, to now photographing and enjoying the reputation and distinction of being a main photographer in her own right. Aaron graduated from Cousino High school in 2012. He is attending Macomb Community College and also works at Buchemis. Steven Proudfoot is Julies youngest son, a junior in high school. He is following right behind us and also loves photography. He helps a lot at the studio and helps with some editing. He has done some modelling for us and the speakers also. When PPM had their online print competition, he received 2 awards in the "Next Generation" division, so also has a lot of potential. He loves to assist Julie in the work she does for the high school sports - like football and cheer-leading etc. Each will have their own page to highlight their accomplishments and best work. Besides competition prints, and other fine art, this can also include the best images we have created in our travels through out the years to our favorite locations. Even our favorite images of the work we create on a daily bases. 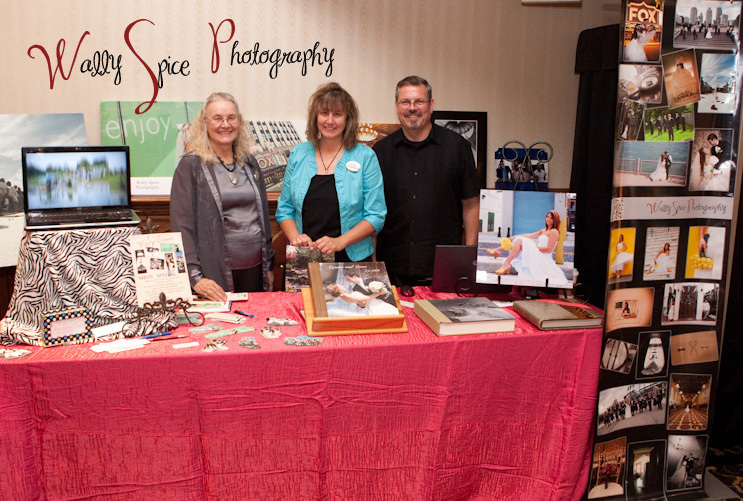 Some photos of us at other bridal shows and the former in home studio in Hazel Park. The Family of Photographers - taken at Julie and Ed's wedding in Florida - Jan 31, 2013.